70% of Brits would withdraw an offer on a house due to noisy neighbours. Loving thy neighbour can be a difficult task when you have party animals living next door.It's even more difficult when you try to sell your home. A recent study undertaken by the team at SellHouseFast.uk has revealed the importance that potential buyers place on their neighbours. In fact, noisy neighbours were the biggest turn off when buying a home according to a 2015 survey of 1084 Brits. 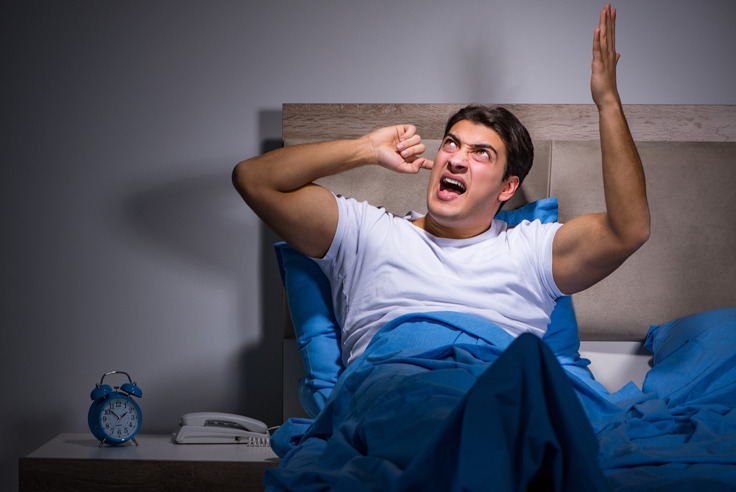 Working alongside noise measurement experts Cirrus Research PLC, we sent out an FOI request to all 33 London borough councils in order to find out where the most parties were being held in the capital- and the effect this has on their sleepless neighbours. In at number one was the London borough of Newham, where there were 5,935 party complaints or 68% of all noise complaints made in 2016. The high number of parties thrown could be due in part to the relatively young demographic of the borough, as more than a quarter of residents are aged 25 or younger thanks to its high student population and proximity to the University of Greenwich. 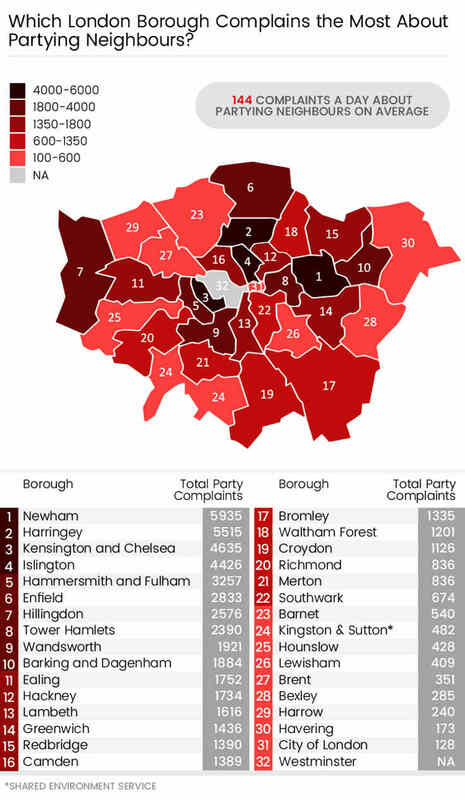 Complaints about parties in Newham accounted for 16% of the total complaints for all of London. In second place was Haringey, where there was a total of 5,515 complaints made about raucous parties, averaging out at 15 complaints a DAY. 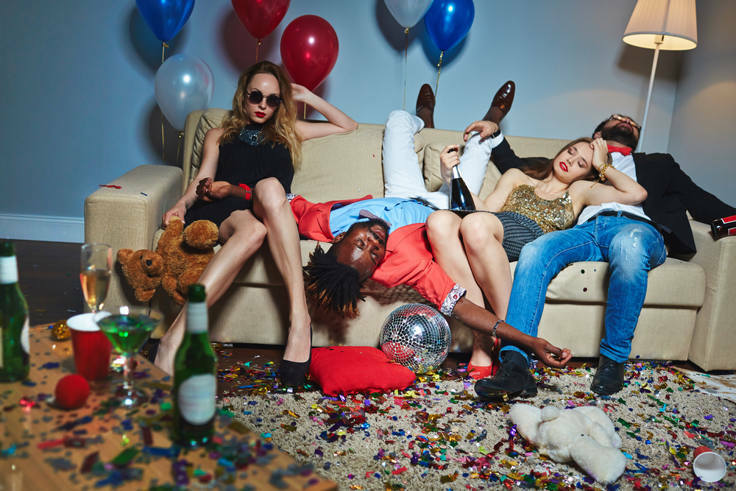 The Royal borough of Kensington and Chelsea also featured in the top ten list, its council received 4,635 complaints about partying residents in 2016. Islington, home to two universities, had 4,426 complaints a year against loud music and social gatherings in the borough. This is followed by Hammersmith and Fulham (3,257 complaints), Enfield (2,833 complaints), Hillingdon (2,576 complaints), Tower Hamlets (2,390 complaints), Wandsworth (1,921 complaints) and finally east London’s Barking and Dagenham, whose council received a grand total of 1,884 complaints about out-of-control parties. On the lower end of the scale was the City of London, where the focus is more on working than partying. Havering, Harrow, Bexley, Brent and Lewisham all proved to have more sensible residents with fewer complaints about late-night parties. London councils received a total of 142,634 noise complaints last year. 37% of these complaints (or 52,398) were specifically about partying, or the loud music associated with throwing parties. This averages out at 144 complaints a day about next door’s night-time gatherings. One particularly-peeved Croydon resident stated that there was “very loud drumming and bad singing [coming from next door], it sounds like an exorcism." Although it sounds like Londoners may merely be having a good time, they are ignoring the impact this could have on their exhausted neighbours. Law firm Slater Gordon conducted a survey last year, to see how bad neighbour relations had become. It revealed that all-night partying was taking its toll on certain homeowners. Two thirds of whom stated that they are living or have lived next door to a nuisance neighbour. The results had also shown that 20% of the participants had been in contact with their local council over the noise. In the end, things had got so bad for some residents that more than a third had considered moving because of it. Parties or no parties, the UK is seeing a declining relationship with their neighbours. The Good Neighbour Index, designed by the CO-OP, has revealed that the UK is less than half as neighbourly in 2010 than it was thirty years ago. Indeed, according to the study, we would speak to our neighbours at least once a day in 1982, compared to once a week in 2010. What can you do about your noisy neighbours? You could use a mediation service if raising the issue informally doesn’t work. As a last resort, you can take legal action through the courts.